The jury is still out — are they clothespins or clothespegs? Clothes pins? or clothes pegs? I think it depends on where you come from, but whatever you call them, you can take your choice: we have two Clothespin Easter Bunny crafts to choose from, and either one would make an ideal Easter fridgie, or an extra little gift in the Easter basket for someone you love. Children find these attractive to make, but because of the small scale, you might want to help out by pre-cutting the ears, carrot, bow tie and pipe cleaner arms. With all the supplies handy, even a small child can enjoy great results! 1. Paint clothespin in a base coat of white. 2. For the boy bunny, paint the upper half yellow, and the legs blue (refer to photo), leaving the head and feet white. Apply a second coat of white to head and feet. 3. For the long eared girl bunny, apply a second coat of white all over. 4. 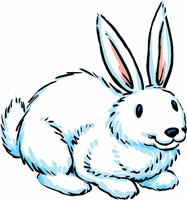 For either bunny: apply facial features, using markers, paint markers or paint (using a fine tipped brush). The eyes are black, inverted commas, with a small dot of white at the bottom. Paint a small pink heart for the nose, with a wiggly line of pink whiskers on either side (see photo). The mouth is a thin black line in an elongated “w” shape. p. Once you have these assembled, glue to the top of the rabbit’s head. Cut a thin triangular shape to make the carrot. This is so small it is little more than a sliver! Glue to either hand — or to the body area, as I did, before gluing down one hand to “hold” it. If you add it to the body area, finish off by painting on a few green leaves to top the carrot. The perky bow tie can be painted on – or cut, from whatever material you choose to use. Either way, shape the bow tie in a very tiny hourglass shape. If gluing, attach at the neckline with craft glue or hot glue. Cut a length of pipe cleaner to make the arms (approx. 3.5 inches) and bend to fit before gluing in place at the back of the neck. Get creative! Make several bunnies in different colours. 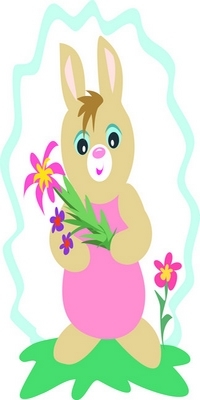 Skip the carrot, and give him a tiny Easter basket or posy of flowers to hold. The possibilities are endless and limited only by your imagination.